Calling the dry, hot desert of Nevada home guarantees that we don’t see much snow, especially when we want it most...Christmas morning. For those who live in the right climate, a White Christmas starts with a gentle snowfall fluttering down from the sky adding to the beautiful layer of snow already covering everything as far as the eye can see. The little ones are snuggling into bed with the anticipation of Santa’s arrival Christmas Eve and the thoughts of all the joyous fun to be had building snowmen and snow angels Christmas morning. For these people, it’s difficult not to feel the Christmas Spirit; it’s gently forced on them by Mother Nature. 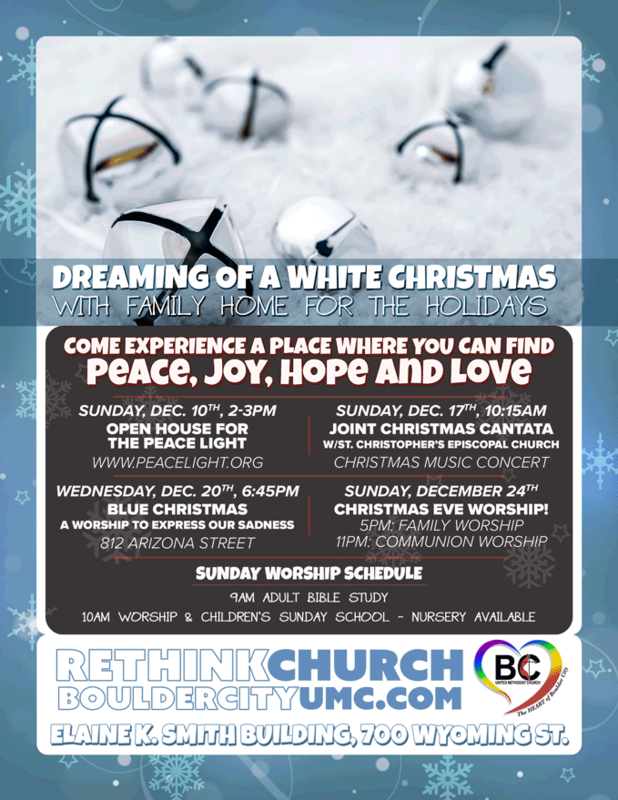 For those of us lucky enough to call Boulder City home, every year we get to come up with a festive, abstract way for our families to experience the best “White Christmas” possible. This year, the Boulder City United Methodist Church is here to help make your dreams come true. The theme for the Church this holiday season is fortuitously “White Christmas,“ and they have a lot planned to help you get the most out of the Holiday Season. All month, their services (held on Sundays at 10am in the Elaine K. Smith Building at 700 Wyoming Street) will be adorned with a delightful dazzling of warm white lights and silver bells nestled into the trees dispersed throughout their place of worship. We asked Pastor Sandy Johnson, and unfortunately, they will not have the interior decorated with fresh snow, your best bet for that is still a day trip to Mount Charleston. The best part of the Holiday Season is the time spent with family, making memories and traditions, especially those made attending all the family-friendly holiday events throughout our hometown. This time of year there are so many events to choose from, and Boulder City United Methodist Church has some extraordinary events they are hosting to get the community into the holiday spirit. There will be an open house for the Peace Light on Sunday, December 10th from 2 to 3pm to share the light with the neighborhood. You can bring a lamp or candle to take the light home. The Peace Light was lit by an oil lamp at the Grotto under the Church of the Nativity in Bethlehem, which is believed to be the site of Jesus’ birth. Oil lamps have been continuously burning there for over one thousand years! For the last 23 years, a child from Austria is chosen to fetch the Peace Light from one of these lamps. The flame is used to light two blast-proof miner’s lamps, originally designed to be used in coal mines. The lit lamps are carried aboard an Austrian Airlines jet to Vienna, and since 2004, to New York City. Scouts meet the Peace Light at JFK Airport, and light their lamps from the miner’s lamps, spreading the Peace Light across the North American continent. Pastor Sandy will pick up the light on Monday, December 6th from Green River, Utah and share it with someone taking the light to Southern California. The light is shared in the spirit of the one who was born there over 2,000 years ago, Jesus Christ, the one that the Bible calls, the Light of the World, and the Prince of Peace. The prophet Isaiah, long ago, spoke these words, “The people who walked in darkness have seen a great light; those who lived in a land of deep darkness–on them light has shined.” This light gives us hope, which even though there is much darkness in the world, we can still see signs of loving and peaceful community. We can still see people living together in harmony, and working together for Christ’s peace and justice. To learn more about the Peace Light, visit www.PeaceLight.org. The next two events are presented in conjunction with St. Christopher’s Episcopal Church. The first, a Christmas Cantata featuring both churches choirs, will take place on Sunday, December 17th at 10:15am. A cantata is “a vocal composition with instrumental accompaniment.” That sounds like a sure fire way to get into the Christmas Spirit. So, get the family, bring your friends and maybe even invite a few strangers on the way. A seat in this audience is guaranteed to have even the grinchiest Grinch donning a Santa hat and humming along. This year’s “Blue Christmas” will be taking place at St. Christopher’s Episcopal Church (812 Arizona Street) on Wednesday, December 20th. This worship session is for those of us who are feeling blue; unfortunately, Christmas isn’t always happy and jolly. The “Blue Christmas” worship acknowledges that this may be the first Christmas without a loved one, or a painful season without someone special. This service will provide you the space to feel blue and receive God’s love. Finally, to close out the season, the Christmas Eve Worship will take place on Sunday, December 24th. Family worship with candle lighting will be at 5pm. The final service of the night at 11pm will be a candlelight worship with communion.